I had Getting Things Done, the be-all, end-all book on personal and business organization (or so I'm told, at any rate) on my shelf for three years before I picked it up. I'd joke every year about how the first thing I needed to do to get things done was read the damn book about getting things done, and then promptly... not read it. But 2015 marks the year that I finally got that one pesky thing done, and I read the damn book. Our minds are not safes. They are also not safe. They forget things, like, all the time. They are actually designed to do this, so that we don't get overwhelmed by the thousands of stimuli we see on a daily basis. So why do we think that trying to remember everything we need to get done is the best way to make sure it gets done? Be it at work or at home, projects are large, multi-faceted, and complex by their very nature. "Clean the garage" is not a to-do-list-worthy item; "Buy shelving system for the garage" is. Breaking things down into actionable steps is what makes action happen. Whatever your organization system is, you have to trust it. If you have even a sliver of a doubt that you may have left something off your to-do list, or forgotten to note an important email, or, or, or... you've gone right back to relying on your brain to try to remember everything it will likely forget. Getting Things Done is at its strongest when talking about the micro-level; Allen's approach to high-level thinking about life/career goals, plans, etc. is given enough time in the book to distract from the common-sense approach to getting things done, but not enough time to make it valuable. But it serves as an important reminder that the high-level stuff can't be completed thoroughly or to our satisfaction unless we give ourselves permission to stop worrying about the micro-level: the phone calls to be made, the emails to be replied to, the papers to be filed. 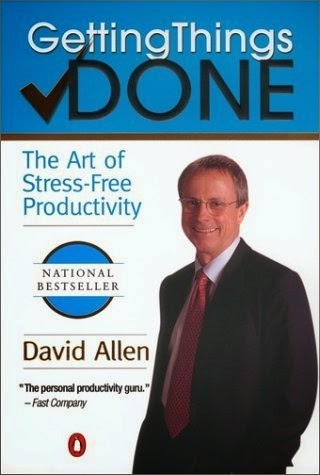 Allen advocates (surprising to no one) that readers revisit his book and its approach every few months, reminding themselves of the "rules" of the GTD system and, hopefully, discovering new ideas or concepts previously overlooked. I'll be holding off on my re-read until the updated edition of Getting Things Done is available later this year, on the assumption that it won't contain so many references to LotusNotes and Palm Pilots. In the meantime, I'll be over here working on my GTD system, setting up my filing cabinet, and generally trying to apply common sense to my otherwise uncommonly nonsensical lists of things to get done. If you're in the GTD camp, I'd love to hear about your system, what software (if any) you use, and any tips you have for someone just about to pull all her inputs together to set this thing up. Read as part of my 2015 TBR Challenge list, and as my self-help selection for the 2015 Read Harder Challenge. I'm married to OmniFocus. It is the alpha and the omega of my GTD practice. The boyfriend and I just ordered this (and The Power of Habit! We're on a productivity kick. ), and I'm so excited to finally read it. I've been using the bullet journal system to keep track of my to-do list for about six months, which I really like, but I'm ready to go deeper. TBR Tag: What's on My Pile?